Last year while I was living in the San Francisco Bay Area, my good friend and “neighbor-from-across-the-street” Wendy invited me to join her to the opening of Jean Paul Gaultier’s exhibition presented at the De Young Museum in San Francisco. We both were excited to see it but not sure what to expect other than another dress exhibit made possible thanks to the generosity of the SF socialites who kindly donated their gowns. We were so wrong! The minute we entered the exhibit, we could feel something different was going on this time. 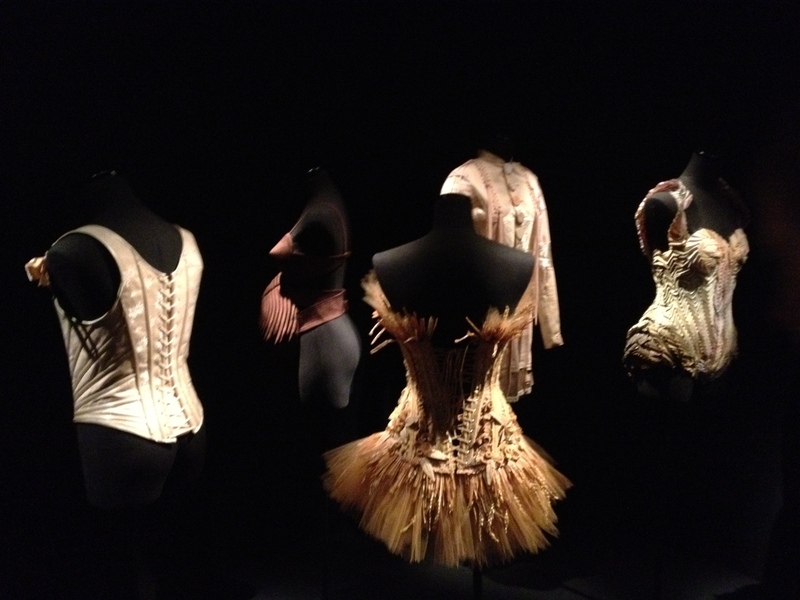 From the distance we could see a group of mannequins, dressed in Gaultier’s finest creations, waiting to greet visitors. When we approached them, we realized these mannequins were talking (in English, Spanish, French!) and making all kinds of facial expressions. The woman next to me cried when she saw the first mannequin “She just winked at me, she just winked at me! 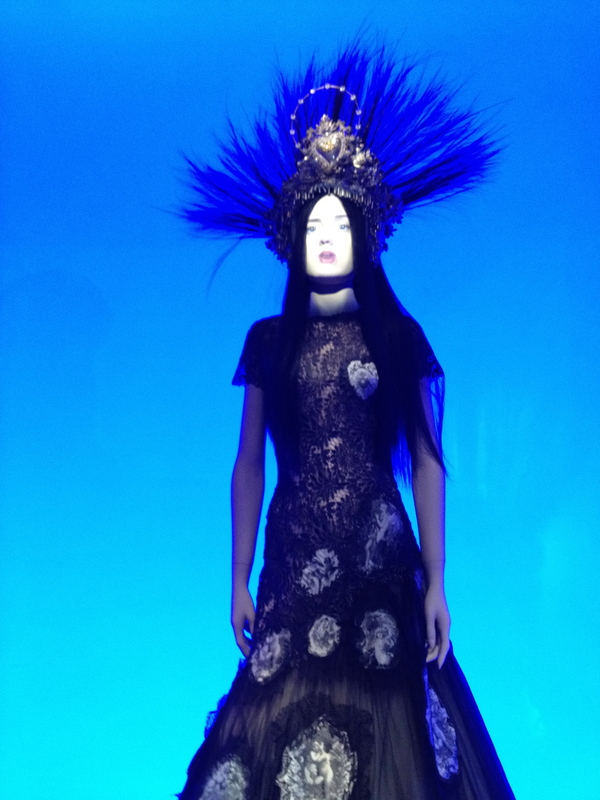 !” It all felt kind of like a surreal fun ride at Gaultier’s whimsical Disney World. The way they achieved this lifelike effect is by projecting faces on the thirty animated mannequins, and by attaching to them some kind of sensory gadget which makes them come alive when visitors approach them, when they provide spontaneous commentaries with playful and poetic phrases. 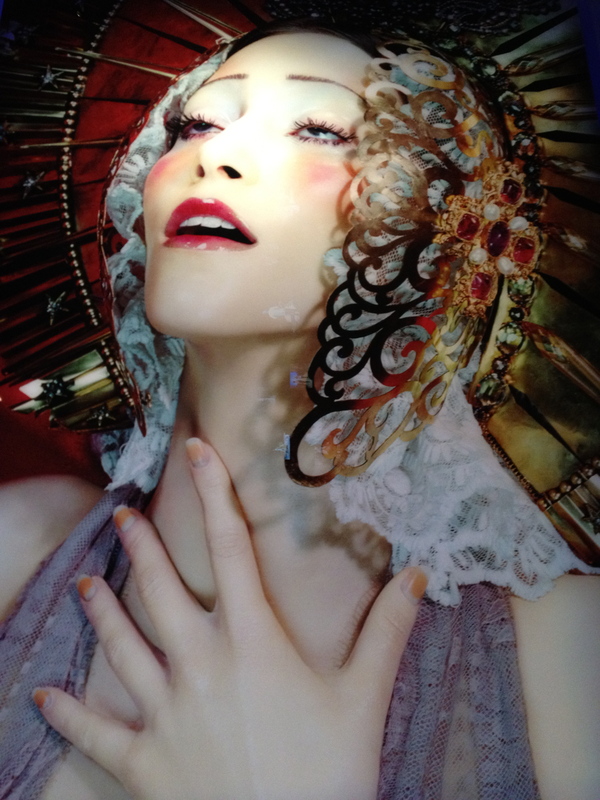 The multimedia exhibition journeys through Gaultier’s career, starting with collections from 1976 to the present, including more than 130 ready to wear and haute couture ensembles, as well as sketches, stage costumes (Madonna!! ), and excerpts from films, runway shows, concerts, dance performances, and televised interviews. What really surprised me is how HUGELY influenced he was by everything Latin in his creations! In his “Vírgenes” collection (2007), he shows a Latin Goddess-like woman: Powerful, Spiritual and Motherly. In his “Guadalupe” gown, (worn by Catherine Deneuve to the Oscars in 2007) he even included and embroidered broken heart, bleeding inside out from all the pain inflicted. How more Latin can you get? I read at the exhibit that Gaultier spent a great time with his maternal grandmother. She definitely had a huge effect on him. She owned a television set in the 1960s, which was very unusual in Paris at the time, and indulged her grandson by allowing him to watch whatever he pleased. I wonder how many “telenovelas” influenced his collections! I also learned that as a kid he would spend hours excavating through his grandmother’s closet, digging for corsets and waist cinchers, which later helped him create his “underwear as outerwear” collections. Funny, I kind of spent my childhood in Argentina doing the same in my grandmother’s closet… What is up with these French / Latin abuelas? Are they to blame for modern fashion? The last part of the exhibit is a homage to Frida Kalho from his 1998 pret-a-porter collection. What a perfect way to end our tour! Boleros, Bullfighters and Roses reminded me once more of the strength, beauty and power of the Latin Woman. I never imagined Jean Paul Gaultier had such a strong connection to our Latin Soul. I left the De Young Museum in San Francisco feeling, once again, empowered, beautiful and proud to be a Latingringa.